What is Mountain Trail and Trail Challenges? 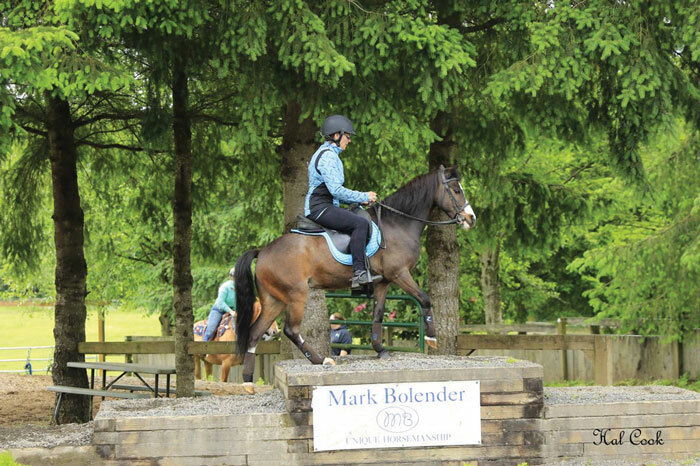 Mountain Trail is an exciting and relatively new competitive equestrian sport. Negotiating difficult obstacles that might be found on a typical mountain trail alongside other competitors can be an exhilarating experience for the rider. And for the spectators watching the competition it can be just as thrilling – as demonstrated by the growing number of enthusiasts in the sport. And like other equestrian sports, Mountain Trail requires special training. 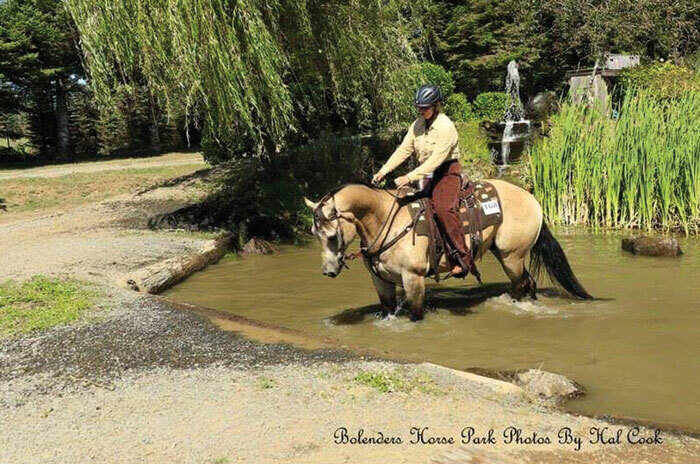 Horses will not naturally or easily descend a hill into a pond, then over a swinging bridge and then through heavy logs and boulders. When done to perfection, the horse moves through such obstacles with boldness and confidence you just don’t see in other sports. The concept for the sport of Mountain Trail was born out in the Pacific Northwest of the USA where rocks and logs were brought into a show ring or where the Mountain Trail was brought indoors. Mark and Lee Bolender saw the beauty of this Mountain Trail concept and begin to work on a foundation starting in 2010 to take a concept into a new discipline called Mountain Trail. IMTCA – International Mountain Trail Challenge Association was formed in 2013 and rolled out in 2014. 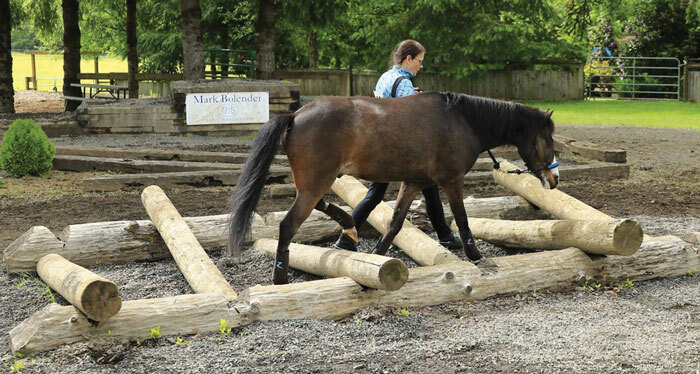 The association oversees the standards for obstacles, challenges and judging rules. Twelve shows/challenges where held in first two years with over 3,000 individual scores given out. Mark and Lee took this discipline across the US, Canada, Australia and Europe by teaching clinics, judging clinics, building Mountain Trail Course, writing articles, producing training DVD’s, writing books and demonstrating this from coast to coast at horse expo’s. This new discipline has also been showcased on RFDTV first in 2016 and then in 2018. The discipline has taken hold and is growing rapidly. The sport of Mountain Trail has become an endeavor to navigate trail obstacles with skill and finesse, with or without a ticking clock. A primary focus Mountain Trail is not only proper and safely negotiating the obstacles in a timely manner, but executing them as a partnership between horse and rider. This is obvious to anybody watching; when the horse and rider “disconnect” it seems like the rider is making the horse perform the task of negotiating obstacles. Yet if a partnership of mutual trust exists, horse and rider appear as one single living being, and that image is rivaled by few feats of man and beast. It’s like a virtuoso violin performance, where the boundary between the human and the instrument becomes blurred in order to create beautiful music. So are the horse and rider who mutually trust their instincts, and together negotiate seemingly impossible obstacles. 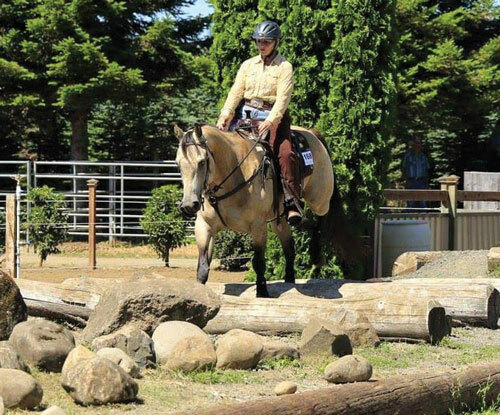 Some of the patterns are so difficult that the rider has to completely “release” to the horse’s instinct to take over because the rider simply cannot process everything the horse can. In other times it’s necessary for the horse to take direction from the rider. Most times, there is a balance, and that’s what the unity and partnership is all about. Such unity can only be achieved with proper training, where the horse’s mind is the main focus of the training. Training the horse on how to think and then allowed to use its instincts is not only the only way to train for Mountain Trail, but it’s the best road for preventing injuries. While technically inaccurate, sometimes the terms Mountain Trail and Extreme Trail are referred to as the same sport. 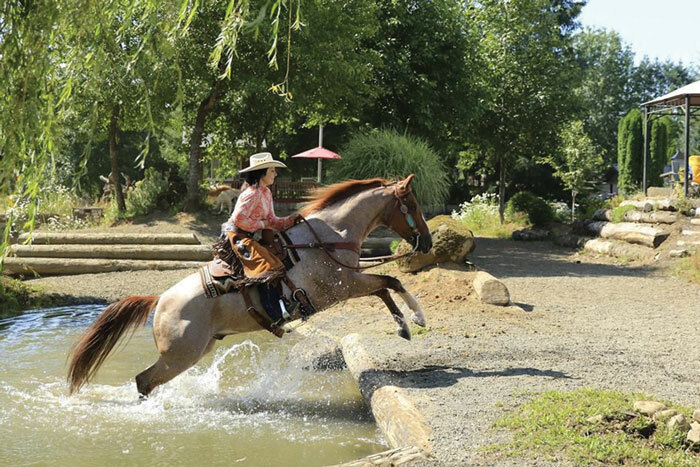 A spin off from Mountain Trail was the AQHA Trail Challenge which has many of the same obstacles and some shows were using Mountain Trail Courses. 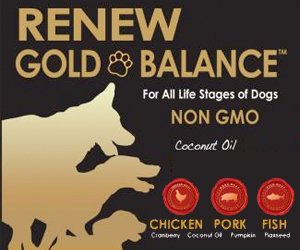 Bolender’s are focused on taking this discipline across the world for the next ten years. At present Mountain Trail clinics have been taught across the USA, Europe, Canada and Australia and Mountain Trail Courses have also been constructed. Excitement is growing as talented new apprentices from Germany, Austria, Australia, Columbia, Italy, Canada and from across the US come to learn how to train and judge Mountain Trail and build the sport. A key factor to growth is building Mountain Trail courses. These courses range from elaborate out door to mini indoor and medium expo Mountain Trail Courses. The next elaborate Mountain Trail Courses to be built will be in Akron OH, Syracuse NY, TX and two more in Australia. This discipline was showcased at the National Western Stock Show for three day in January of 2018 and will be demonstrated at the Quarter Horse Congress in October of 2018 and the first world show is scheduled for the fall of 2019 in Denver CO. This is the first equine discipline to have all breeds, all riding styles in the same class competing on equal footing. It will be the first discipline to bring everyone together on equal footing in the same class regardless of breed or riding style. This is a very forward go type discipline so gaited horses and English breed horses have a place to shine. Happy Trail and Bolender Blessing.